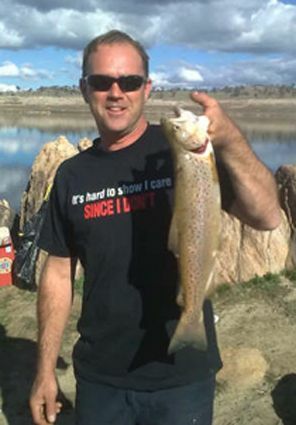 Headlines: Fishing has been great recently with some fantastic Autumn weather. In the rivers a few early spawners are on the cards anytime now. Bait fishing in the lakes has been excellent and some good trolling and flyfishing in the lakes. 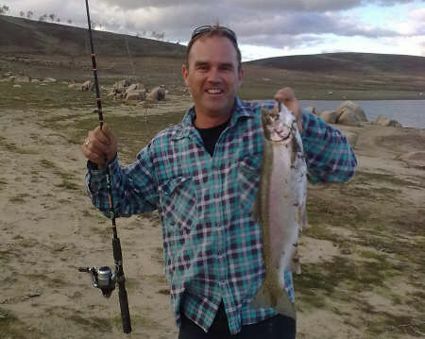 I fished the Eucumbene river for the first time this weekend. 2 glorious days under blue skies. Was put on to using a weighted glo bug with bead head nymph whilst buying some well needed gloves. 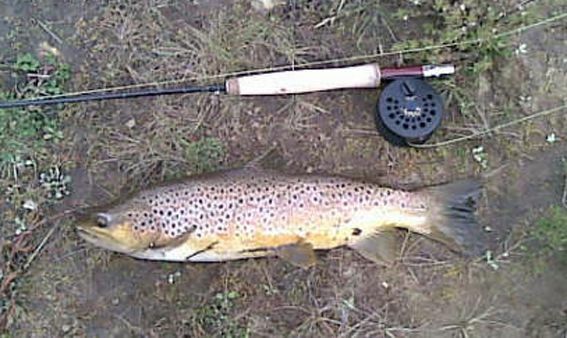 Caught my first river fish on fly which was this very well conditioned browny on my 3wt. She was released for a well needed swim after taking me down 2 pools. 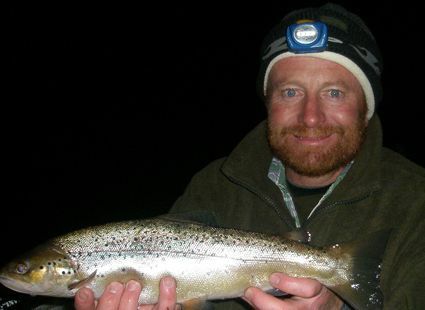 *Stuart "GC" Sturgeon with a chunky little lake brown from a recent night session. 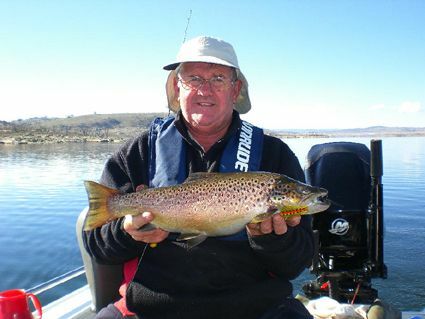 Eucumbene:- Trolling has been good overall with many lure types producing fish. Leadcore in deeper water has been a good producer over the last two weeks. . Trout pattern minnows in Rapalas, Attacks, RMG Scorpions have worked well with Tassies in multitudes of patterns turning up some great fish. Lofty's in the Corroboree pattern have been very good also. rainbows from the bank with Ken and John. 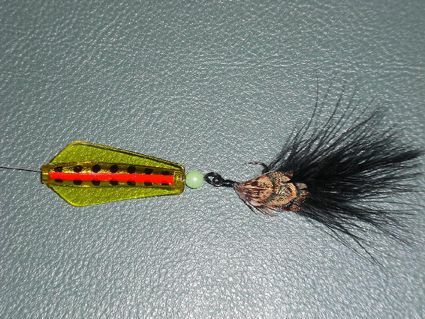 John Nowak made these new AAK flies (Alan's Arse Killer) so we decided to troll them around the lake. Caught a few nice Browns over the last couple of weeks near Pasture Bay. No sooner got in the area and off she went. Gee it is good when things come together and they work. The bank fishing was great on Gulp Chunky Cheese power bait. See you next week. 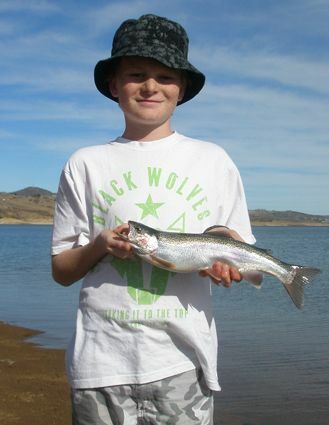 *Guys, Attached is a photo of a nice 4lb rainbow I caught after the snow fall, at the very head of braemar bay. The mates and I leadlined devils until early afternoon (Tuesday 28th) near the wall and then around in Cobrabald bay with only 1 hook up. There were virtually no fish all morning on the sounder. So to change things up a bit we switched to flat lining some RMG Scorpions in red/gold, with instant success. We had half a dozen hits in a matter of 15 minutes, with 3 fish in the boat. It was getting toward late afternoon and we were on the way back to the ramp, when we decided to give Braemar bay one quick sweep. We had literally run out of water in the very top end of the bay, with the boat in 5 feet of water, when this beauty took the Scorpion. It just goes to show how prepared you have to be to change either method or colour or both when things are quiet. Just wish we had done it a little earlier! Perfect conditions with very little wind, overcast mid morning and still warm to boot. Water temps around 12 degrees and 10 in the shadows, fish still rising and taking interest even at 11am. Trolled all the way up to the Snowy arm from Kalkite on the east bank, took awhile but had one hit, one landed, one lost and one follow on a plastic all from the same weed bed. Sighted some good fish around the banks, ideal polaroiding weather but the water level is dropping pretty fast. By the time I caught up with the others they had retired to the bank for some playdo / worm bashing. Using some new techniques and educating Luke to the random Powerbait game was fun, with eight rods out between four of us only a chosen couple won the lottery ( Jason and Victor excluded ). Lemon Twist and Scrub worms took out the day and I was seriously smoked by an unstopable, called it for a big Brown / Atlantic who took me to dissapointment town ( Population, me ). Luke had a lucky Scrubby which commenced to hook and land two fish in 10 minutes while I was running out fingers to count on my rod was getting hit so much. Got busted off again on 6lb braid ( Think snag rub type stuff ) before landing a nice 51cm Brown and another Rainbow, biggest Bow went 42cm on the troll. 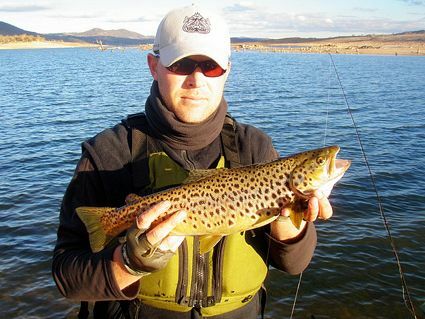 Such an unpredictable place that runs hot or cold for various anglers, almost bagging out and losing a fish of a lifetime is just viewed as the norm here. Looking forward to returning, the Brown was completely full of tiny Shrimp and the Bows had small Yabbies and some green stuff ( Daphnia? ). All fish on lures on Predatek Min Min in Perch and Brown Trout pattern, Jason even caught some on olive powerbait flick baits chucked at the trees. 2 x rainbows. Mudeyes are scarce but the worm and powerbait fishing has been good enough that most have given up using mudeyes. Powerbait has come into its own this past week. Remember to fish it on the bottom but with a light gauge short shank hook, like the Gamakatsu single egg or Daiichi 2171 in a sz 6 are perfect. Best colours have been the Chartreuse and Sherbert nuggets along with Gulp Chunky Cheese paste. Scrub worms have been doing very well over the last week as well. Just a quick note for the web page on fishing at Seven Gates 2 may 2009 bait fishing on Green powerbait. 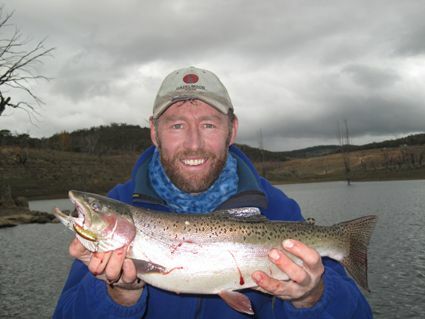 We called into Alpine Angler on Saturday morning to pick up some mudeyes and have a chat on the lastest fishing tips. Thanks to the advice on the green powerpait, we netted 10 lovely trout over saturday and sunday, 9 rainbows none under 3lb and a king brown 6.5lb off the bank at 2 o'clock on Saturday afternoon, unheard of. I have added some photos of some of the fish caught on a great weekend weather wise. The challenge was on between Craig and Janette against Mick and Lisa. 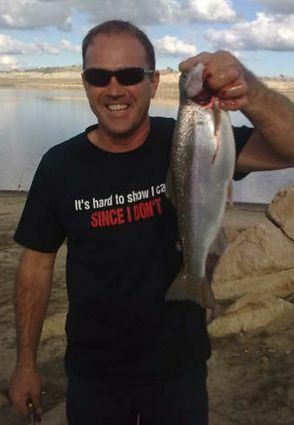 Craig and Janette came in with 9 fish (Craig 7 Janette 2) and Mick caught the last rainbow at 7pm Sunday night. We had a great weekend at Seven Gates. Thanks again for the always friendly advice and service. Great going Guys you even let the dog Mishya in for a visit into the shop. Janette Mulcahy & Craig Hansen. *David and John Xuereb and John Palmano pictured below (Johnny Scrubworm Photo) with a catch from Collingwood bay on Saturday night. 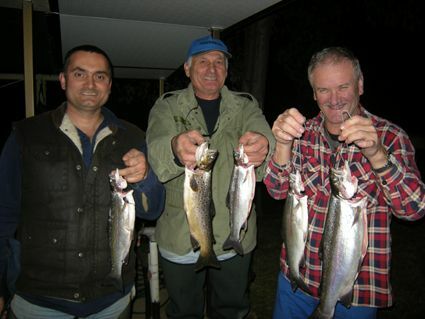 John "Killer" Palmano is holding the biggest on the far right which went 1.4kg cleaned. Fish ate mudeyes. Foxes again have been a problem in this area and they will steal unattended fish, bag and all! 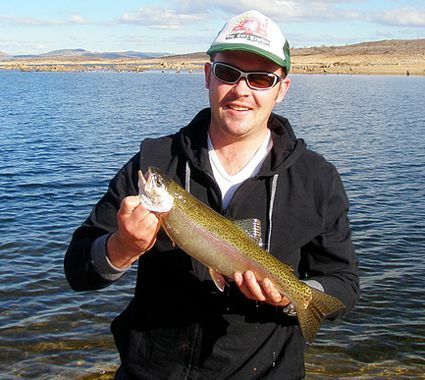 *Lachlan Sturgeon with a nice rainbow out of Jindabyne recently. It seems that he has made a habit of out fishing dad of late.